The Infiniti Q50 is filled with a ridiculous amount of fancy gadgetry, yet it’s just not a very exciting proposition for enthusiasts. What do you need to know before you buy a Q50? Don’t worry, we’ll tell you everything right here in our Buyer’s Guide. 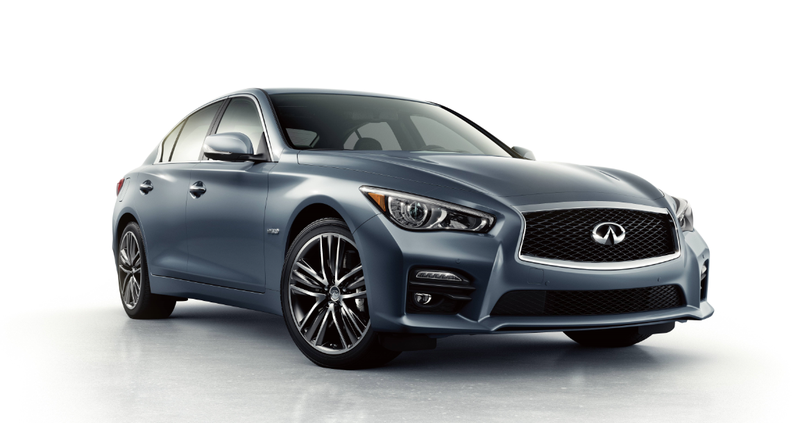 The new Infiniti Q50 is very different from the G37 that it replaces. Sure, the powertrain offerings are similar, but this new Q50 represents Infiniti’s shift towards building bolder luxury sedans to compete with the Germans. Though the new Q50 looks much sharper than its predecessor, it still looks a bit bland. It’s not a bad look at all, it just doesn’t stand out in any way. BMW and Mercedes stands out for looking gorgeous in a refined sort of way. Lexus’s IS stands out for looking gorgeous in a Holy Crap What Is That kind of way. The Infiniti Q50? It looks good, but we wouldn’t call it gorgeous. Aside from the looks, the Q50 is basically just a rolling tech show. Infiniti went especially nuts with safety tech. To name a few: Around View monitor with Moving Object Detection, Blind Spot Warning and Intervention Systems, Forward Emergency Braking, Distance Control Assist, Backup Collision Intervention, Intelligent Cruise Control, Predictive Forward Collision Warning. Sure, it looks cool, it’s rather nice to sit in, it’s remarkably well-equipped it’s and a dream sedan for any gadget lover. But due to the lack of low-end torque, the unwilling-to-perform automatic gearbox, computer-simulated sport steering, its too-quiet engine, and maybe even a lack of soul, the Q50 is never going to be a car you look forward to hooning. It’s not a car that makes you want to take the long, twisty way home from work. Infiniti nailed the tech. They just didn’t add enough testosterone. So, for you geeks out there, this might still be a good car for you. But you heel-toe track warriors should just move along. Remember that Infiniti G35 that your college roommate used to do donuts with in the school parking lot? In 2009, that car lost its 3.5-cylinder V6 and gained a 330 horsepower 3.7-liter, so naturally it got a new name: G37. The G37 kept the 6-speed manual from its predecessor, but received a new 7-speed automatic instead of the dated 5-cog. Over the years, the G37 received revised styling, available all-wheel drive, a convertible version and lots of shuffling of standard options. But in 2013, Infiniti showed the world an all-new luxury sedan meant to replace the G37. They called it the Q50, and though it sadly lost the manual transmission found in the G37 sedan, the 2014 Q50 got an all new V37 platform, new Bolder But Still Not That Bold styling, hybrid models and tons of new safety and infotainment gadgetry. After the new, much prettier and better equipped luxury sedan launched for 2014, Infiniti relaxed for the 2015 model year, so the only major change to the ‘15 Q50 is the addition of a new wheel package, which includes 19-inch RAYS alloy wheels and summer tires. The Q50 comes in five trims: 3.7, 3.7 Premium, S 3.7, Hybrid Premium and S Hybrid. Each trim can be had in either rear or all-wheel drive. We don’t think the Q50 is the best option in its class, but if we had to buy one, we’d get a hybrid model. You may demand my Jalop card after you read this, but I liked the hybrid version better. It’s seamless in its transition from electric to gas, and it can run on pure EV mode at low speeds and on the highway. All it really does is add a bunch of power and improve fuel economy, and if you turn off the energy display menu on the screen above the steering wheel, you never know it’s there. It’s the least hybrid-y hybrid I’ve ever driven, and I mean that in a good way. Okay, so Patrick didn’t lose his Jalop card, as Michael Ballaban quickly came to his side and agreed in his review that the hybrid Q50 is indeed the Q50 to buy. A Q50 Hybrid Premium starts at $44,400 and comes well equipped with the 360 horsepower V6 hybrid engine, a 7-speed automatic, leather heated power seats, 17-inch alloy wheels, that crazy drive-by-wire steering system called Direct Adaptive Steering, a moonroof, power tilt and telescoping steering wheel, rearview monitor, 14-speaker Bose sound system, satellite radio, automatic LED headlights, speed-sensing wipers, dual-zone automatic climate control, dual LCD displays (8-inch and 7-inch), and tons more. Since we’d be buying the Q50 almost purely for its tech, we’d go big and tack on the $6,400 Deluxe Technology Package, which adds an Around View monitor with Moving Object Detection, front and rear sonar systems, Blind Spot Warning and Intervention Systems, Forward Emergency Braking, Distance Control Assist, Backup Collision Intervention, Intelligent Cruise Control, Predictive Forward Collision Warning and any other string of words that, when put together, sounds like it might prevent someone from dying in an accident. All in with destination, we’d have to drop $51,705. And if we were obsessed with gadgets more than we cared about driving experience, we’d probably seek out a deal or a nice lease and be perfectly happy.